After knitting Don's mittens, I cast on for my own pair. Wool mittens are so cozy to run in. Unfortunately, I haven't had a chance to use them for their intended purpose. It's been too warm to wear mittens while running. I did wear them while walking around Cannon Beach. 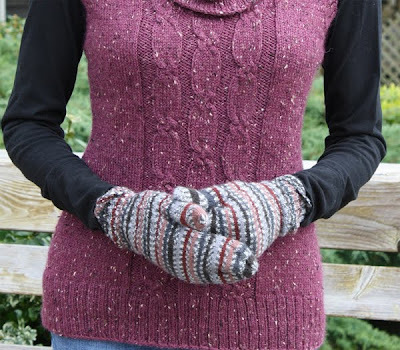 The pattern is improvised, just basic mittens with an offset thumb for a good fit. The yarn is self-striping Regia sock yarn. My sister gave it to my mom who gave it to me. None of us are big sock knitters. It was in the family stash for several years before I went digging around to find mitten yarn. In a skein, the variegation was nothing to look at. But when the self striping worked its magic, it was beautiful to behold. 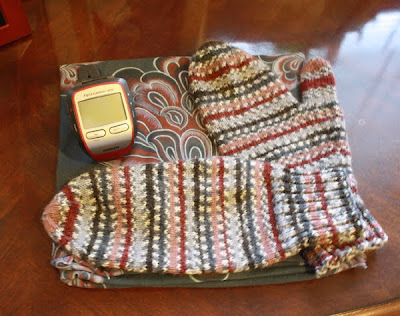 It was only later that I realized my mittens would coordinate well with my Garmin and Buff. It's highly satisfying when things effortlessly align.